Butter chicken with naan – perfect comfort food anytime. With the cool Fall weather comes cravings for warm hearty comfort food, and this creamy luscious butter chicken does not disappoint. Serve this dish atop fluffy basmati rice, or use as a vessel to dip your pillowy naan, and eat curled up by the crackling fireplace for maximum indulgence. As it is made completely in the slow cooker, this dish is easy to prepare and makes your house smell divine as the aroma infuses the air. I have made this dish for potlucks, dinner parties, or just an easy weeknight meal and it is always a hit. Enjoy and comment below how you liked it! 2. Chop chicken thighs into bite size pieces and put on top of chopped onion. Sprinkle with salt if desired. 3. Mix all the remaining sauce ingredients in separate bowl. Whisk together and pour over the chicken. Mix all together in slow cooker. 4. Add 2 tablespoons of cold butter on top. Cover and cook on high for 3.5 – 4 hours. 5. When done, mix together slowly with spoon. (It is ok if it looks a bit curdled, it will become thick and creamy). Add in chopped coriander and stir. Serve immediately. New York City is the city that never sleeps, and luckily for me, is the city that never stops eating. No matter who you are, or what you want, you can definitely find it in NYC. I remember randomly going through a shrimp cocktail phase. I loved the fact that I could come home after a night out, order it from our neighborhood diner, and have it promptly delivered in the middle of the night. No questions asked. We always had our “go to” places for our after-hours cravings. Some of our faves were our favorite Margarita slice in the East Village, or falafels from Mamoun’s, but the meal that always hit the spot was the halal street cart chicken and rice. Warm buttery rice with grilled spicy chicken and the famous white sauce doused on top, accompanied by an unassuming iceberg lettuce salad on the side, was the perfect end to a perfect night. After moving across the country, I did manage to find the street cart chicken in downtown San Francisco, and we also got the Halal Guys in the bay area (yay!). Ironically it wasn’t difficult to find my chicken and rice dish, but the most elusive element was finding the time to go! Luckily I found this recipe that inspired me to make my own version at home. Remember, similar to how each cart has their own flavor and personalization of their spice mix to their dish, feel free to adjust the spices to your own taste! 1. Marinate the chicken: Combine the lemon juice, oregano, coriander, garlic, and olive oil in a blender. Blend until smooth. Season the marinade to taste with kosher salt and black pepper. Season the chicken with salt and pepper. Place the chicken and marinade in a bowl and mix, making sure chicken is coated. Marinate the chicken in the refrigerator for at least 1 hour and up to 4 hours. 2. Preheat oven to 400 degrees F. Heat the oil in a 12-inch heavy-bottomed cast iron or stainless-steel skillet over medium-high heat until it is lightly smoking. Add the chicken pieces and cook without disturbing until they are lightly browned, about 3-4 minutes per side. Transfer the chicken to a casserole dish. Cover and cook in oven for 15 minutes. After 15 minutes, take out and put on counter to cool, keeping lid on. 3. Make the rice: Melt the butter over medium heat in a large Dutch oven. Add the turmeric and cumin and cook until fragrant but not browned, about 1 minute. Add the rice and stir to coat. Cook, stirring frequently, until the rice is lightly toasted, about 4 minutes. Add the water (or chicken broth if using). Season to taste with salt and pepper. Raise the heat to high and bring to a boil. Cover, reduce to a simmer, and cook for 15 minutes without disturbing. Remove from the heat and allow to rest until the water is completely absorbed and the rice is tender, about 15 minutes. 4. While rice and chicken are cooking, make the sauce. In a small bowl, combine the mayonnaise, yogurt, sugar, vinegar, lemon juice, and black pepper. Whisk to combine. Season to taste with salt. Set aside. 5. To serve: Place chicken on cutting board and cut into small pieces. Take rice and arrange on plate. Top with chicken, white sauce, hot sauce, and chopped cilantro (if desired). Serve with chopped iceberg lettuce, tomatoes, and pita on the side if desired. I am not a cold weather person. I love sun and warmth and frolicking on warm sandy beaches. But now it is winter. Initially I was shivering under my down comforter waiting for the sun to come back, but slowly I have come to appreciate certain things about the cold season. I love feeling the crunch of leaves under my new boots while walking on the sidewalk, the sound of crackling sparks from the logs in the fireplace, and curating my ever expanding winter wardrobe of gorgeous scarves and coats and sweaters. But most of all, I love to eat all the “comfort food” that makes me feel warm and fuzzy inside. Things like hot chocolate with melty marshmallows, hearty meaty stews, creamy soups in flaky bread bowls, and any big bowl of pasta with plenty of sauce. Unfortunately every food I am craving is a giant carbohydrate overload. I am living in paleo, gluten free, vegan, low-carb California, and eating all the typical comfort food is often looked upon with judgement from my fellow health conscious Californians. Luckily there are alternatives. 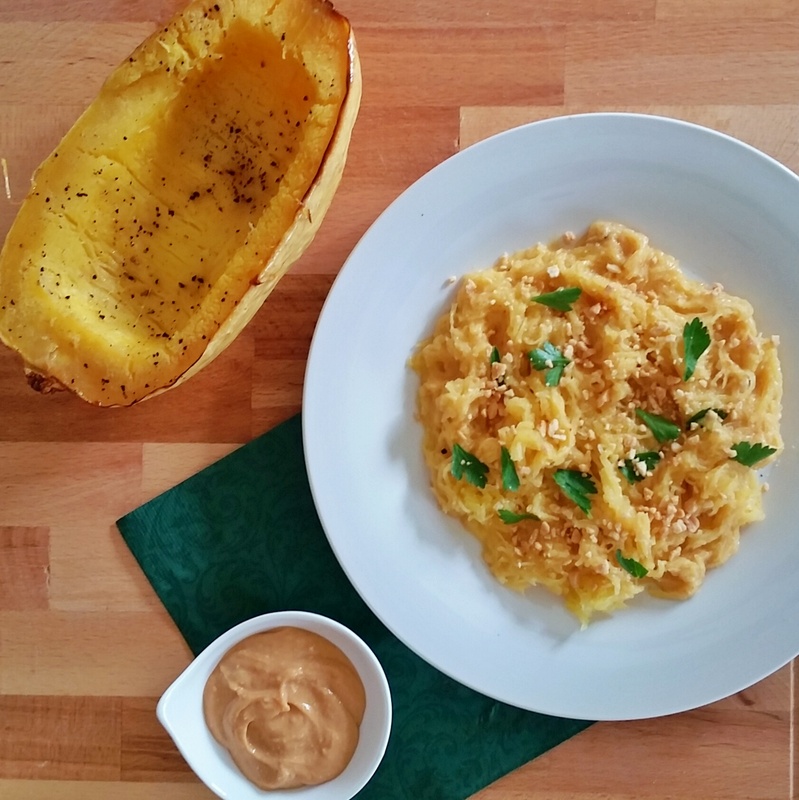 Instead of eating spaghetti and meatballs, I can use spaghetti squash for the pasta which several of my paleo friends have been advocating for some time now. To be honest, it does look like spaghetti and meatballs, but it definitely does not taste like it. My comfort food seeking side was not too happy with this substitution. I just couldn’t mess with a classic. 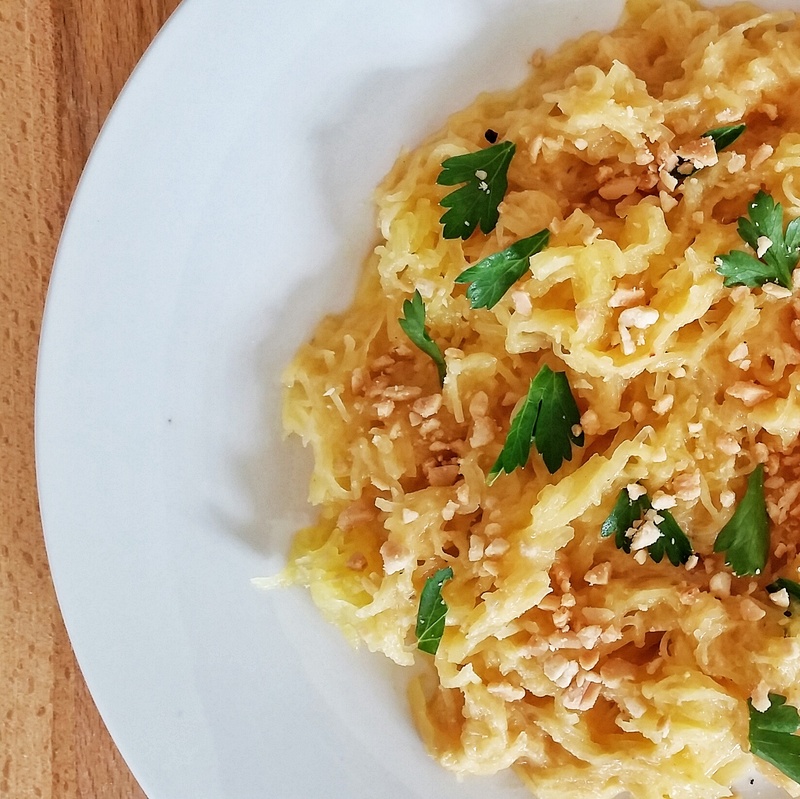 Scrape the inside of roasted spaghetti squash with fork to make noodle like strands. 1. Preheat oven to 350 F. Half the squash and scoop out the seeds. 2. Drizzle inside with olive oil and sprinkle with salt and pepper. Place spaghetti squash cut side down on a baking sheet lined with foil and roast for 45 minutes or until soft. 3. Remove squash from oven and let cool for 10 minutes. Take fork and scoop out the squash. It should come out in little strands that look like noodles. Set aside. 4. While squash is roasting, place all sauce ingredients in a medium saucepan and bring to a boil over medium-high heat. Then turn down to low and simmer for 5 minutes while stirring almost constantly. 5. After sauce thickens a bit, take off heat and set aside. (I liked mine on the thicker side so let it cook for awhile longer). 6. Heat a skillet over medium heat and add olive oil. Add minced garlic, and cook for a minute. Add spaghetti squash, ½ -¾ cup of the peanut sauce pan, chopped cilantro, crushed peanuts. and combine. Stir to combine and cook until heated through (about 2 minutes). 7. Plate and garnish with a little more crushed peanuts and chopped cilantro. Can also add some bean sprouts or other vegetables if desired. Add more sauce if needed. Serve immediately. Based on this recipe from Leelalicious. When I literally have no time to make anything, I often make hamburgers. Just season the ground meat, form it into patties, cook it on the grill, stick it in between two buns, add some cheese and condiments and voila! Dinner is served! A perfect easy meal. But sometimes the perfect meal doesn’t fit into life’s social schedule. This weekend I was in a total dinner dilemma as we went to a barbecue the day before and were invited for another one the day after. Not only was I sandwiched in between two hamburger events, but also had chicken burgers at a birthday party earlier in the day. Then evening rolled around, the kids were starving, and I had to do something with the ground beef that was staring at me from the refrigerator. I needed a non-burger solution. 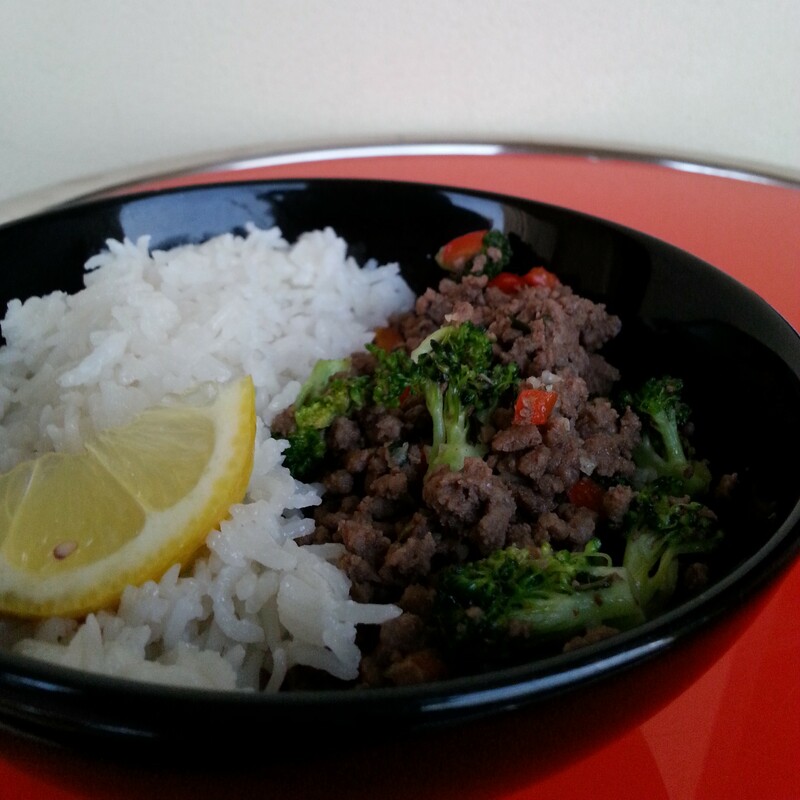 I found this Thai inspired beef dish online and it really hit the spot. I would not say this is an authentic Thai recipe, but it is easy, fast, delicious and does not resemble a hamburger…a perfect easy meal! 1 thai red chili or 1 jalepeno pepper, deseeded and chopped (Optional – Can omit chili if don’t want to be spicy, or just use less chili, or add a few red pepper flakes instead). 1. In a medium saucepan, combine rice, coconut milk, 3/4 cup water, and 1/2 teaspoon salt. Cover and bring to a boil; reduce to a simmer, cover, and cook until rice is tender and liquid has been absorbed, about 25 minutes. 2. While rice is cooking, combine fish sauce, soy sauce, and sugar in a small bowl. Set soy mixture aside. 3. Heat a cast-iron skillet or wok over high. Add oil, and garlic and chilis (if using). Cook, stirring constantly until garlic softened (about a minute). Add veggies and cook for a few minutes. Remove vegetables and set aside. 4. In same pan, add beef and cook until completely browned. Add soy mixture and cook 30 seconds. Add basil and veggies and cook for a couple minutes, stirring to combine. Check for seasoning. 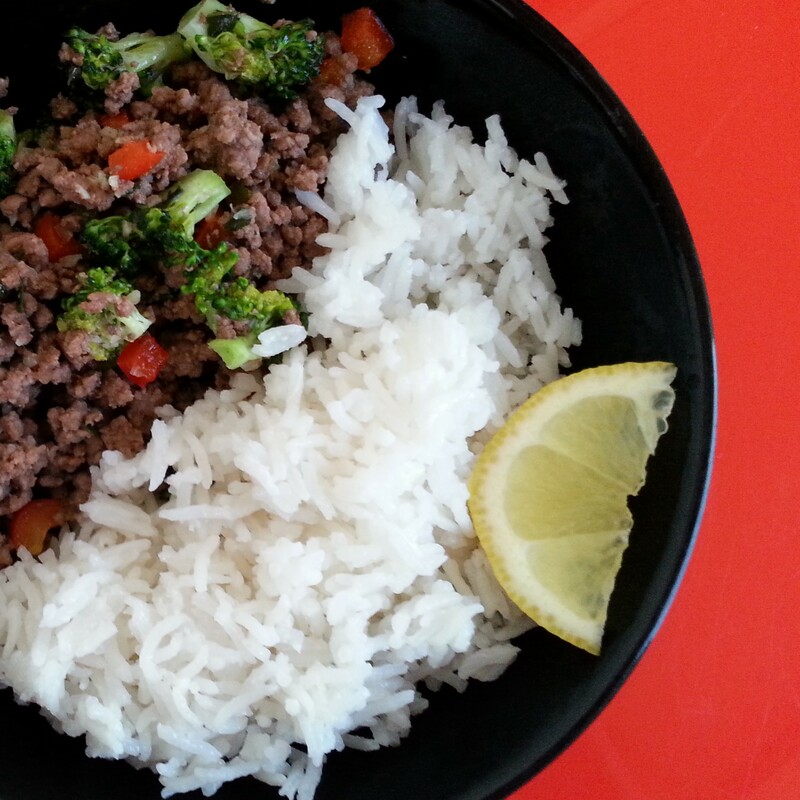 Serve beef over coconut rice with lime wedges. Tastes yummy with some fresh lime squeezed on top. (I didn’t have limes on hand so used lemon and that works too). PANTRY DIVA TIP: You can use ground chicken, turkey, or pork in this recipe. Also feel free to add other spices or seasonings…ginger, onion, etc. You can add any vegetables you have on hand. Good way to clean out the veggie drawer in the fridge! Also, I have noticed that if I am making this for kids, the smaller I chop the veggies the better. Recipe adapted from Martha Stewart’s Thai Beef with Chilis and Basil over Coconut Rice. See original recipe here. Do your weeknight dinners look like this? Not only did I make these dinners at home (in 30 minutes) with healthy and organic ingredients, but all ingredients and corresponding recipes were delivered right to my door! 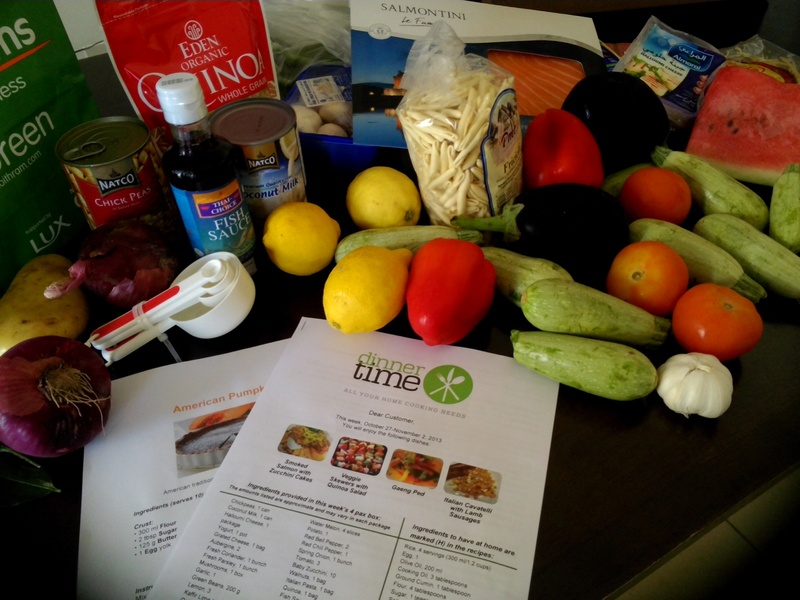 This amazing service was made possible by DinnerTime, a company that takes all the hassle out of meal planning and cooking at home. This is how it works: You place an order by Thursday, and then you receive a delivery on the following Sunday for 4 meals. You get all ingredients and all recipes (except a few pantry staples which are mentioned in the recipes) in your delivery so you do not have to go grocery shopping or stress about what to make. All recipes are easy to prepare and take around 30 minutes to make, so you can make a healthy meal at home both quickly and easily. Here is what my delivery looked like after I unpacked it…complete with ingredients, recipes, and measuring cups. This was the favorite of the week, and I have also included the recipe at the end of this post. I timed it, and all the meals really do take around 30 minutes to prepare. An added benefit is when you make the dish again, you are more familiar with it and can make it even faster the next time. My family actually asked for this curry again and the next time I made it, I shaved about 5 minutes off my time! Woohoo! Another plus is that I had some of the ingredients left over from the initial DinnerTime order, such as the red curry paste and fish sauce, so I did not have to buy them again, which was great value for money. 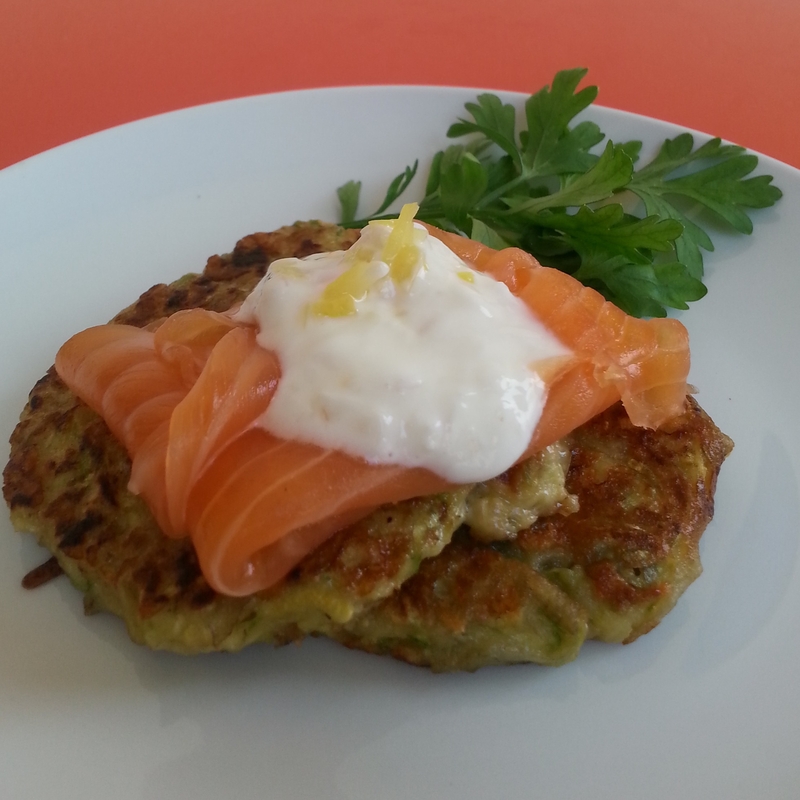 Surprisingly the kids liked the smoked salmon but not the zucchini cakes. It could have also been that I did not cook them properly as they were a bit soggy, although the taste was delicious. I also want to mention the good quality of ingredients; the smoked salmon was from Salmontini and the vegetables were from GreenHeart Organic Farms. This day was very hectic, and I just did not have time to skewer the veggies. Instead I just stir fried them in a wok and also pan fried the halloumi cheese. I still made it within 30 minutes, so was happy about that! I also loved that the recipe was flexible enough so I could make last minute changes and still manage to get a good meal on the table! This was another favorite of the week. Pasta is always a crowd pleaser, but sometimes pasta can be boring if you make it the same way all the time. 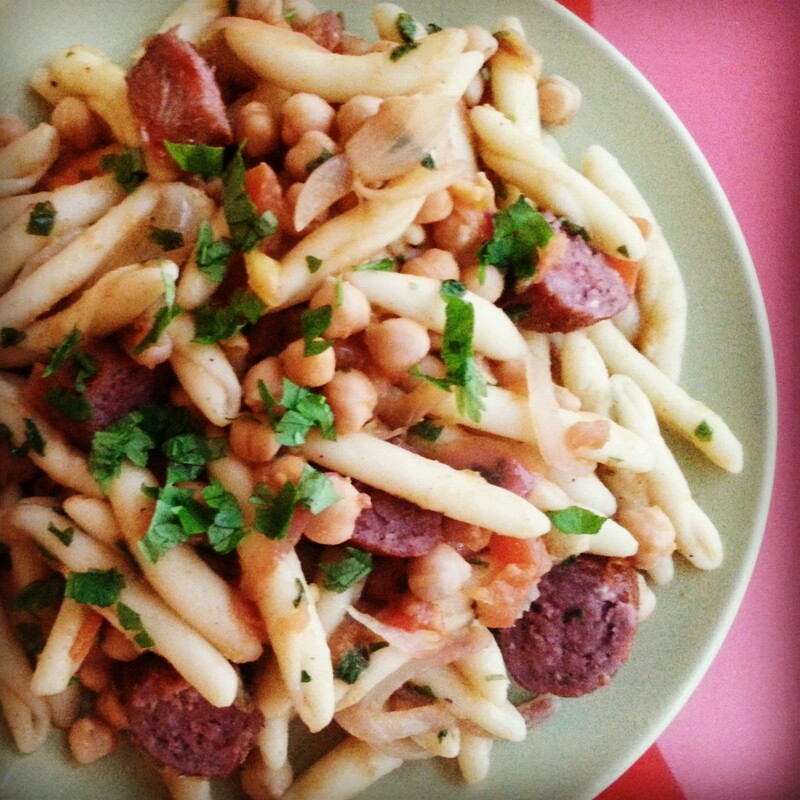 But this pasta had chickpeas and spices and other ingredients I hadn’t associated with Italian cuisine, so it was totally new to me, and the sausages went perfectly with it. Overall, I had a great experience with DinnerTime. To get a nutritious meal on the table without the hassle of shopping and meal planning is a great service for these busy times we live in. But even for someone like me who cooks a lot, it introduced me to new ideas and new dishes I would not have tried before. If I had to give any critique, I would only say that if you have very picky eaters, you may have issues with them eating or trying a new meal. I must admit, my kids did not love the veggies and quinoa meal, and I had to make a quick mac n’cheese for them to eat, but I still had a great meal for my husband and myself to enjoy. We would definitely do this again. Try DinnerTime for yourself! 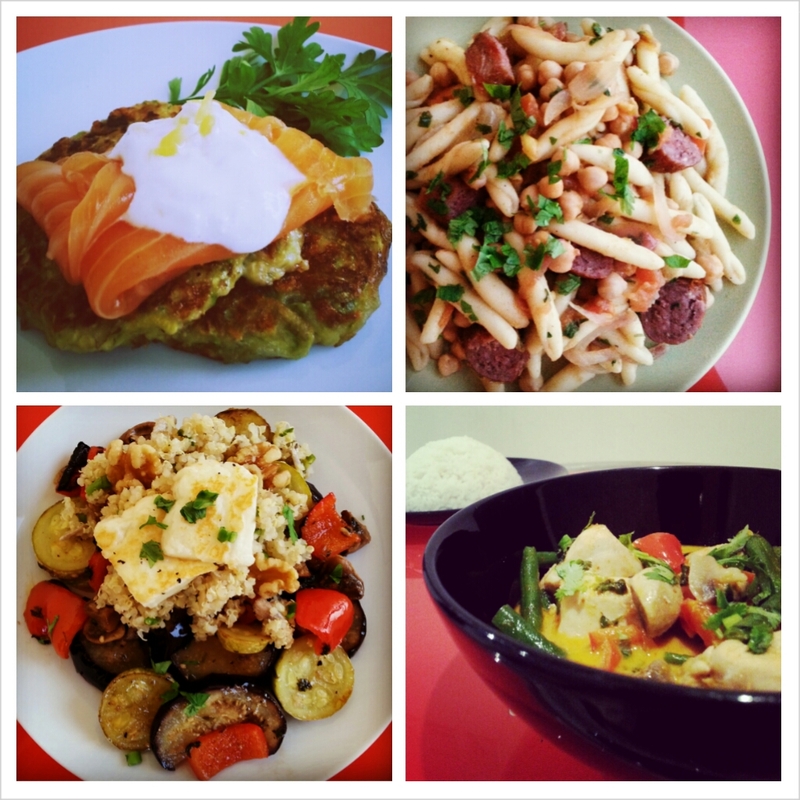 Place order on www.dinnertime.me or by phone +971 55-790-8733 by previous Thursday for Sunday delivery. Deliveries are for either 4 person or 2 person meals. A Gluten Free option is also available, which has the same recipes but uses gluten free ingredients. Here is a sample recipe of what you can expect if you order. My family loved this one and we have already made it again! Start boiling 4 servings of rice according to the package instructions. Cut the chicken fillet into bite-size pieces. 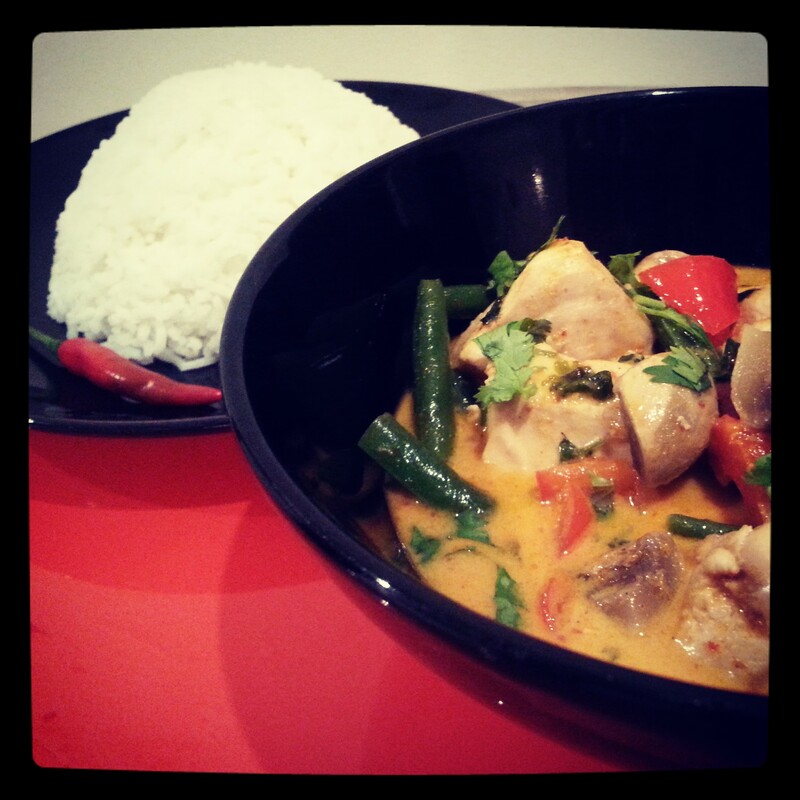 In a large frying pan, set coconut milk and red curry paste to boil. Add the fish sauce, sugar, and lime leaves. Add the chicken fillet and let simmer for about 10 minutes, until chicken is cooked through. Rinse the green beans and cut them into halves and cut the bell pepper into pieces. Wash and slice the mushrooms. Add in the green beans and mushrooms when the chicken is just about done. Let it simmer for a few more minutes. Add the bell pepper and simmer for another minute. 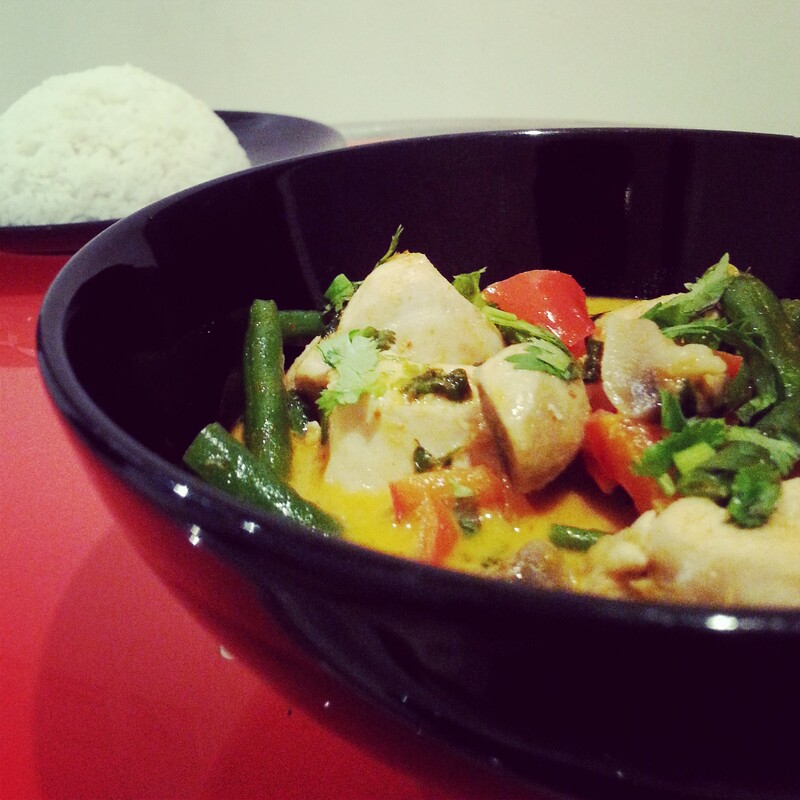 Serve the chicken with rice and garnish with coriander. I have a confession to make. I call myself the Pantry Diva but there are times when even my pantry is bare. We were on vacation this past week and were eating out often, and I did not do my usual grocery shopping. Of course my lack of meal planning had no impact on my family’s incessant daily hunger pangs. One evening, we just returned from the beach and everyone was starving. I needed to make something fast and with literally no ingredients on hand. I decided to make khichidi, which is a one pot meal of rice and daal and vegetables and spices. As everyone was scarfing down my khichidi, I was putting all the spices back in my cupboard and I noticed one in particular: Hing. Hing (Asafoetida) can be bought in Indian grocery stores. Hing? Although I have been using it for years, I realized I didn’t know much about it. I wondered what exactly is this strange spice and why does it make the khichidi taste so good? 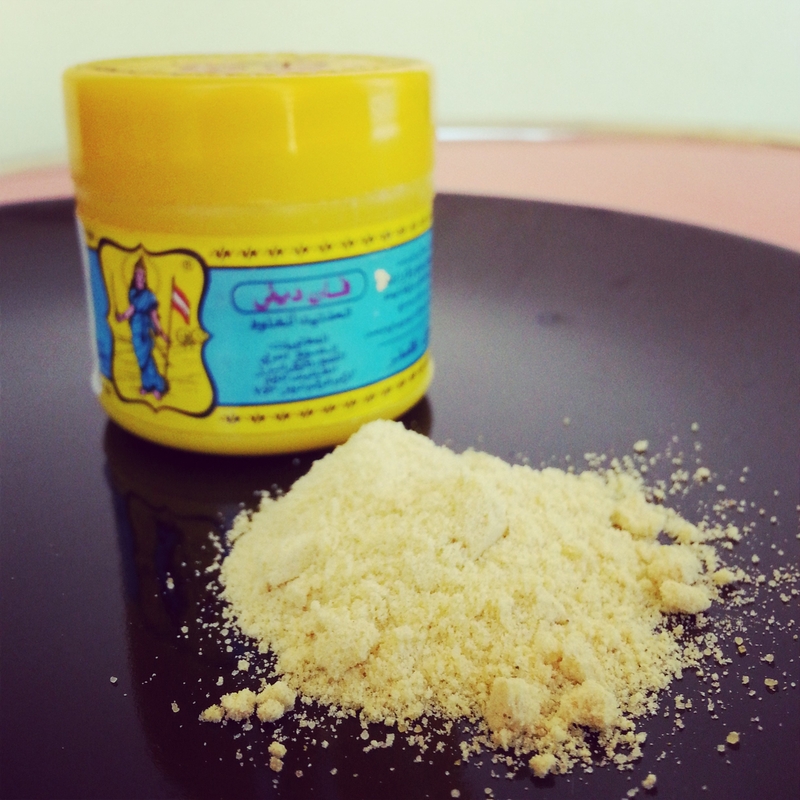 After some googling I found out Hing (Asafoetida in English) is a dried and ground resin extracted from a plant. Based on its unpleasant smell in its natural form, hing has been called such names as “Devil’s Dung” or “stinking gum”. This initial information was not encouraging me to find out more about hing. But I kept reading, and it got better: We usually buy hing from the supermarket in its commercial form not fresh form, so the flavor and smell is much more mild. It adds a savory flavor to the food similar to sautéed onion and garlic. In addition to being a flavor enhancer, it also has some health benefits such as aiding digestion and reducing gas. You can find more information about Hing here and here. 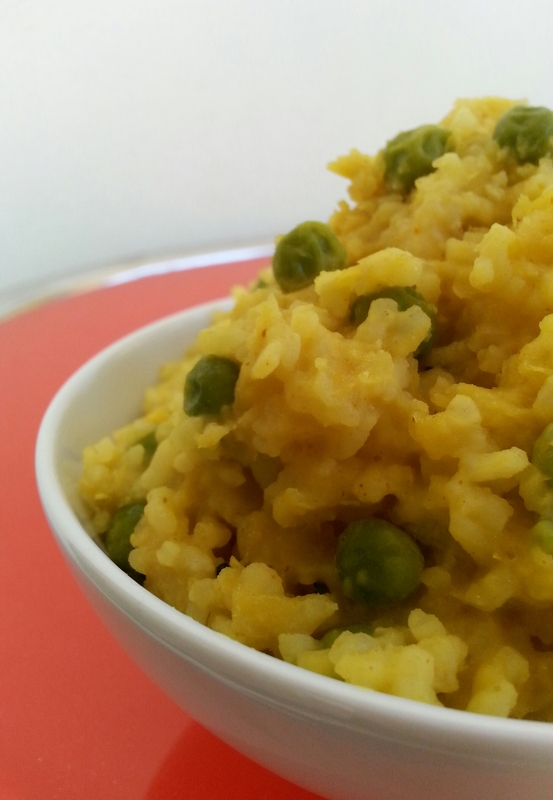 Because the khichidi recipe is so versatile, you can add any combination of veggies and spices. I have made it both with and without hing and trust me, you need it. Although it has a subtle flavor, hing is the one spice that is essential in a tasty khichidi. You don’t notice it when it’s there, but you definitely miss it when it’s gone. And remember, a little hing goes a long way…you don’t need to use much. You can find it in any Indian grocery store if your local supermarket doesn’t have it. Apparently it is used in many other Indian dishes too so feel free to experiment. Add Hing (Asafoetida) into your pantry today! 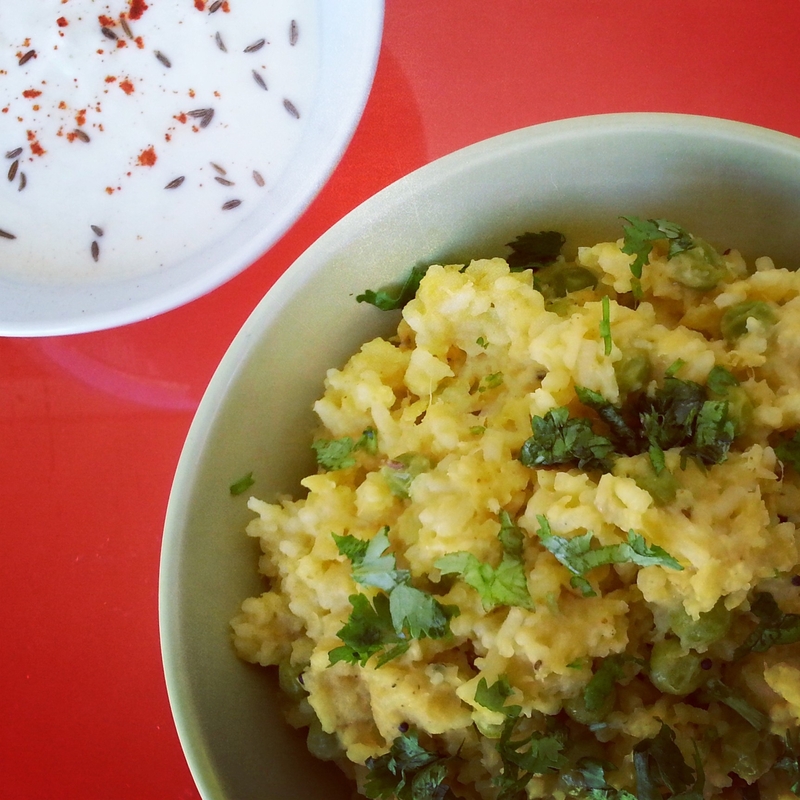 Pantry Diva Tip: This khichidi recipe required grated fresh ginger, and I had no time to go shopping. Store your fresh ginger in the freezer, it keeps for a really long time. When a recipe calls for fresh ginger, just take it out of the freezer, grate what you need, and put it back in. No need to run to the store each time you need ginger! NOTE: I tend to add more water (about 3 cups water) as I like the khichdi texture kind of “goopy”and stuck together, not like separate grains of rice. Feel free to reduce amount of water. 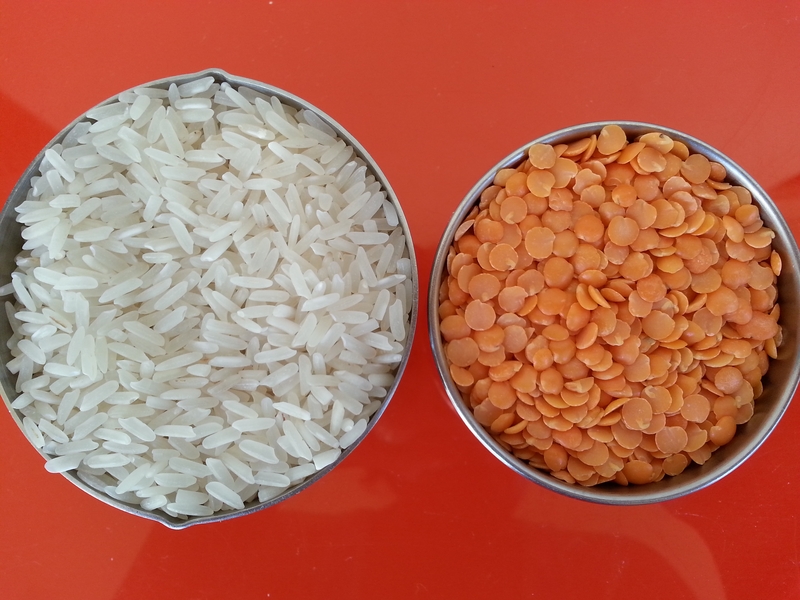 But, if you have NOT presoaked the rice and daal, you can add more water and increase cooking time. NOTE: My recipe above is just a guide. You can add any vegetables you have on hand such as grated carrots, cauliflower, broccoli, peas, etc. You can also add different spices, such as coriander powder, cumin powder, garam masala, black pepper, ginger, garlic. Just remember that this is a simple dish and you don’t want too many flavors competing with each other. Less is more! 1. Wash rice and daal and soak for 20 minutes. Note: You do not need to soak beforehand but then you must increase water and cooking time. 2. Heat oil in a pot, and when hot add the cumin seeds, mustard seeds and hing and stir for a minute. 3. Add chopped onion and stir until very light brown. 4. Add ginger, chili powder, turmeric, and salt and sauté for a few minutes. 5. Add drained rice and daal and mix. 6. Add water and peas and any additional vegetables. Heat until boils. 7. Cover pot and and cook on low heat until rice is done. It is usually done when there are little holes on top of the rice and the water has evaporated. 8. If desired, garnish with chopped coriander and serve with yoghurt or raita. When I first moved to Dubai, it was all about brunch. Friday brunch is an institution in Dubai, and since I was not yet a mother, Friday brunch had soon become my weekly tradition. I had endless hours to eat, drink, and be merry. (I also had endless hours to recover the next day, as I used to do this thing called “sleep.” ) But now that I have two very rambunctious boys, I cannot just laze around for hours doing brunch. With my new time constraints, I have now moved on to breakfast or shall I say “brekkie.” It fits into my current lifestyle well as breakfast is so early in the day, an essential quality for my little early risers, as well as being a relatively quick meal so we can go out and do other things. At first I was not accustomed to eating much at breakfast. In the past, I never had much appetite early in the morning (probably because I was still sleeping). But if I did happen to be awake, I would eat some cereal at the most. Soon, as my brekkie dates got more regular, I noticed I would always order the same thing: quiche. I loved how no matter what type of quiche I would order, it would always taste good…smoked salmon and chives, artichokes and onions and cheese, roasted red pepper and feta…the delicious combinations were endless. The funny thing is that I always thought of quiche as something I could only buy at a restaurant, and not something I could make at home. Homemade crust? I thought that must surely take ages and won’t be easy to do with my little monkeys running around. It was not until I went to my friend’s place for breakfast (who has 3 kids) and served me homemade quiche at 9:30am straight out of her oven that I realized quiche was a home made brekkie possibility. I did try one version here, but I have since simplified it and have an even easier, tastier and healthier version I make now. I am constantly trying to get my kids to eat more veggies, and they actually like this! This recipe takes less than 30 minutes to prepare so it is definitely something you can throw together quickly (and clean up while it bakes), or even make ahead and rewarm later. I would love for you to try it and let me know how it turns out. 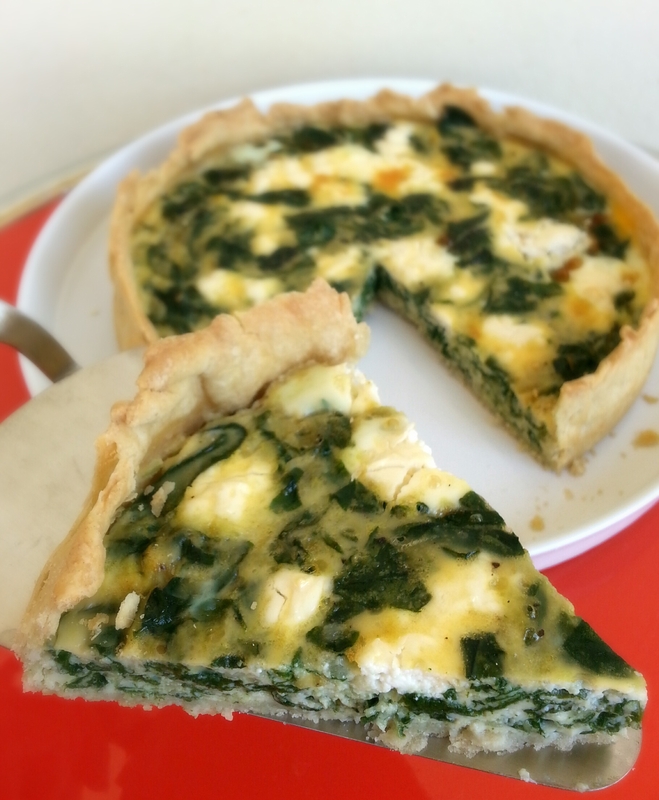 I would also love to hear your favorite quiche recipe or flavor! 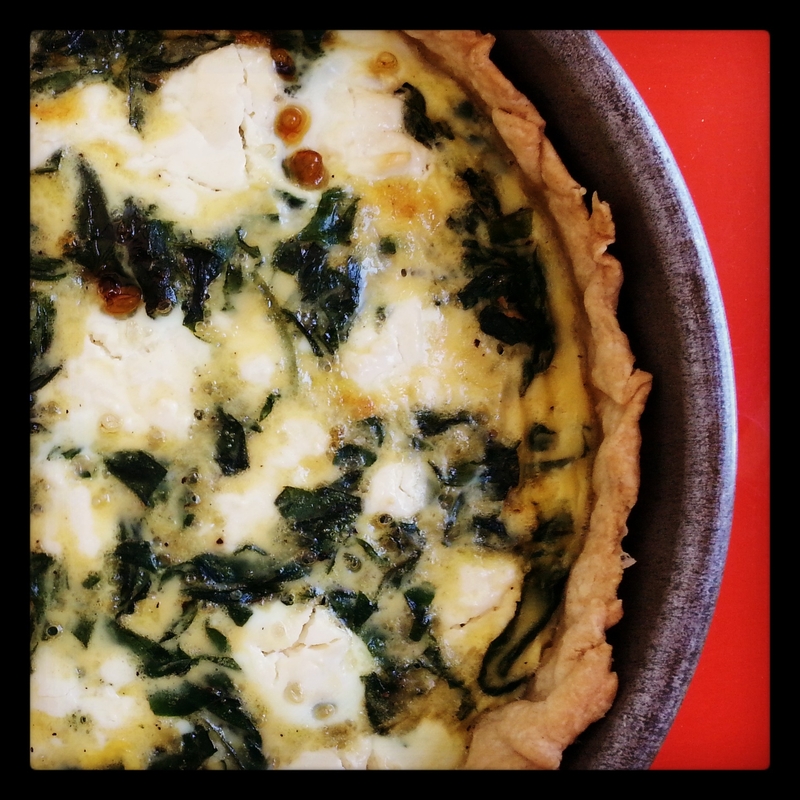 Pantry Diva Tip: Feel free to use up any veggies or cheese you have hanging out in your fridge, quiche is a great way to clean out that veggie drawer! PS. Hubby eats this too…yes men do like quiche, they just don’t always admit it! 1. Mix flour and salt with fork. 2. Beat oil (if using) and water with fork to thicken and pour into flour and salt. If using butter, just pour directly into flour with water. Mix with fork until the dough holds together. 4. Chop onion and garlic in chopper. 5. Heat olive oil in pan and sauté onion and garlic for a couple of minutes, then add chopped spinach and sauté until it is wilted. Season with salt and pepper and let cool. Add spinach mixture into the prepared crust. 6. In separate bowl, beat eggs, milk ( and cream if using) with salt and pepper with mixer. Pour over the spinach mixture in crust. 7. 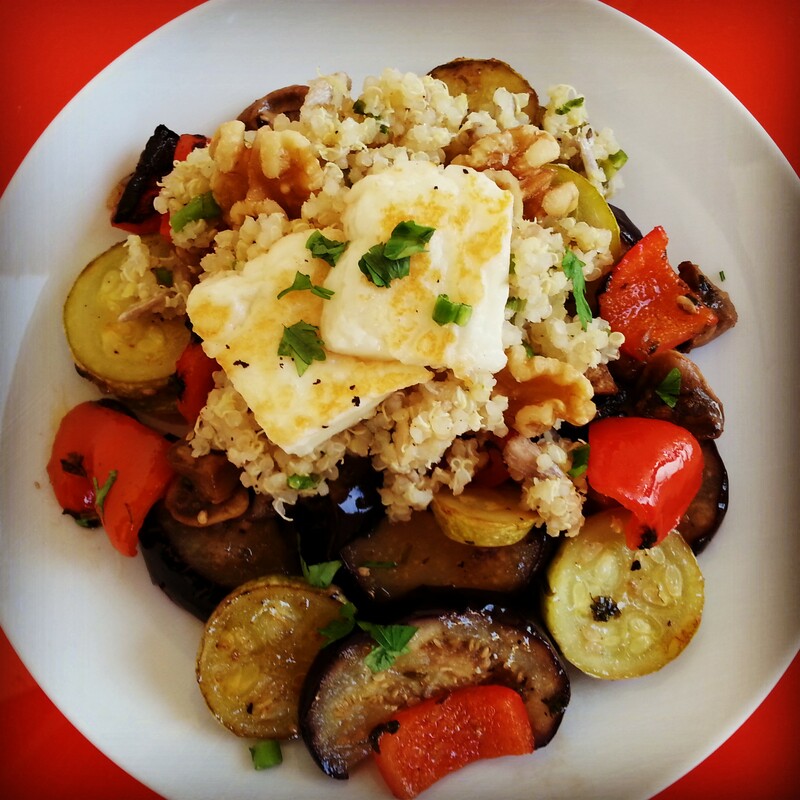 Top with crumbled low fat reduced salt feta cheese, or any cheese of your choice. 8. Bake at 200C/400F until done, around 35-45 minutes. Let cool for 10-15 minutes before cutting. Hello Everyone! So this is my first post as Pantry Diva instead of Khana Mama. This change came about because when people would ask me, “So what is your blog about?”, I always found myself struggling to come up with a succinct answer that would summarize the idea of my blog. So during a brainstorm session with friends, the concept of Pantry Diva was born. I am rejoicing that I now have a tagline: “Making fabulous things from everyday ingredients found in your pantry.” Oh joy! The main difference in Pantry Diva is that I now have a clear direction in writing. But the theme of simple, healthy recipes will remain the same. And by the way, all of the old Khana Mama posts have been transferred to Pantry Diva so nothing has been lost. I still have a bit of reformatting to do, but that will come in time. Please bear with me! A. Walk down to grocery store to buy items and then walk back up and cook. B. Walk down with children to restaurants below. Assuming we would even make it, this would cause them to be hungrier and crankier. C. Order food and make the poor delivery guy walk up to our place. Tempting…but again not the healthiest option and unsure about delivery time. D. Look in the old pantry and see what I can whip up. Walking is not something we do much here in Dubai, and no I will not send my maid down in this heat…so ‘option D’ was the winner. As I was looking through my well stocked pantry I remembered this past summer when I was visiting my family in California and needed to throw together a quick meal without a trip to the store…I made my version of Shakshuka and everyone loved it. 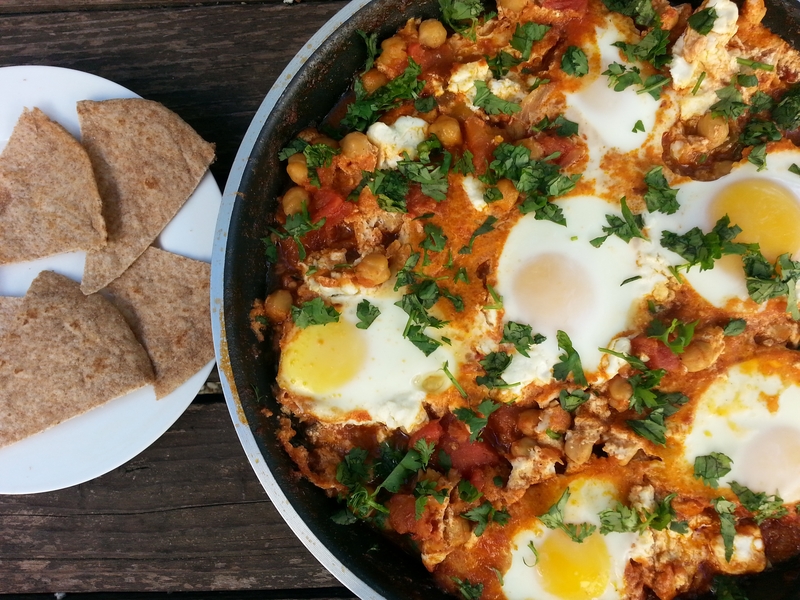 It is traditionally a Middle Eastern breakfast dish of poached eggs in a tomato sauce, but you can enjoy it anytime. You can serve it with Arabic bread, pita, rice, or any bread you have lying around. I like to eat it plain too! 1. Preheat oven to 425°F (220C). Heat oil in a large ovenproof skillet over medium-high heat. Add onion, garlic, and jalapeños; cook, stirring occasionally, until onion is soft, about 6-8 minutes. Add paprika, cumin, and cayenne and chickpeas and cook for 1-2 minutes longer. 2. Add canned tomatoes and their juices. Add red peppers if using. Bring to a boil, reduce heat to medium-low, and simmer, stirring occasionally, until sauce thickens slightly, about 15 minutes. Season to taste with salt and pepper. 3. Sprinkle feta evenly over sauce. 4. Crack eggs one at a time and place over sauce, spacing evenly apart. Transfer skillet to oven and bake until whites are just set but yolks are still runny, 5–8 minutes. (I kept mine in for 8 minutes and they were pretty much cooked through. Also it’s better if you keep the eggs on the surface instead of making little wells and letting eggs touch the bottom of the pan otherwise they overcook immediately). 5. Garnish with cilantro and pine nuts. Serve with pita for dipping. By the way, if you hate eggs, just leave them out! It is delicious without them too. Shakshuka recipe inspired from Epicurious. Have you ever noticed how certain things can trigger different emotions? Maybe you have an outfit that makes you feel amazing so you can walk into a meeting with confidence and authority. Or perhaps you hear an old song on the radio and it brings back fond memories of your first school dance. For me, all my emotions revolve around food. If I’m happy, I eat, if I’m sad, I eat. Even if I’m happy for someone, I make something and go eat with them. I have a recipe that brings me utter joy, and a recipe everyone will thank me for. It is a recipe that will save you on a weekday when you don’t have time to cook. It is a recipe that you can cook and take to a potluck or bring to a friend. It is a recipe that the whole family will enjoy. It is delicious, nutritious and has minimal preparation and cook time. I will not say much more about this recipe but will only relay my emotions about it: I feel love that I have found it, joy when eating it, and now happiness that I can pass it along. 1. Preheat oven to 450°. Put olive oil, garlic, cumin, paprika, cayenne and salt in large bowl and mix. Place chicken inside bowl and mix so it is covered with the mixture. Take out spice covered chicken and place in roasting tray. 2. Pour chickpeas in same large bowl chicken was in. Put ½ cup coriander in as well and mix around. 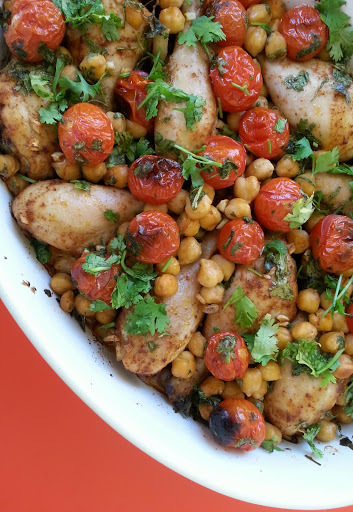 There should still be a bit of spice inside the bowl to coat the chickpeas. Pour the chickpeas over the chicken in the roasting pan. 3. Put the tomatoes on the chicken and chickpeas in the roasting pan and put in oven at 450F for 30 minutes or until done. 4. While chicken is in oven, put yoghurt in a small bowl and add a ½ – 1 teaspoon of cumin, and cayenne and salt to taste. Add water to thin yogurt to desired consistency. Set aside. 5. If desired, make rice or cous cous or salad to serve with chicken. 6. Take chicken out of oven when done, and sprinkle with remaining coriander. Serve with rice or cous cous or pita and yogurt sauce. I could write a novel about the many times my kids have refused to eat what I have cooked. At first I thought their resistance was because the food I was making wasn’t appetizing. (Broccolini and quinoa salad, anyone?). But after careful observation, I have deduced the only reason they won’t eat my food is because they know I am the one making it and they just want to drive me crazy! This realization became evident during dinner, which was chicken curry and fresh chapattis. Although my kids normally like this meal, this time they did not touch it. 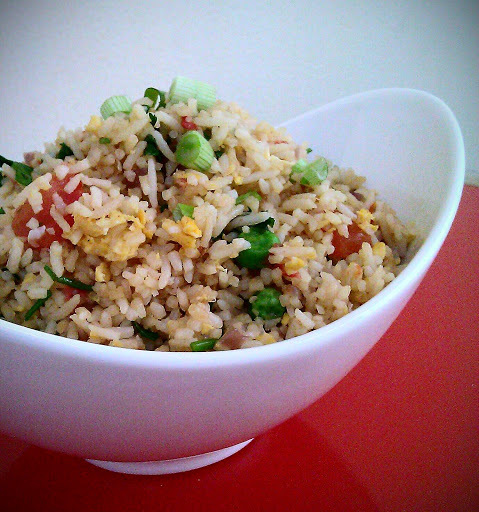 Luckily I had also made some vegetable fried rice (or “wice” as my young one calls it). Unfortunately, the wice was denied as well. I was starting to panic as hungry boys become crazy rowdy destructive boys in about 2 seconds, and I had no desire to clean or make anything else. At that moment my phone rang. It was my dear friend calling to say she had made lentil soup and was sending it over for dinner. I knew my kids hate soup but I was desperate. As the soup arrived I quietly put it in their bowls and waited for their screams of protest. I kept waiting but all I could hear was the sound of soup being slurped down so fast I was afraid they weren’t breathing. Then my older son finally spoke: “Mommy…. ?” he asked. I think to myself: Ok, let me get this straight. You don’t even like soup and now you want it at school too?? I am fuming. I promise I will post the recipe for my friend’s lentil soup soon, as it was delicious and clearly the dinner champion of the evening. But for now you must settle for the runner up, my vegetable fried rice. It is all my fragile ego can handle. Medium pot of cooked rice. Day old, leftover rice is best. 1. Heat the oil on high. Add the onion. Stir well and when it’s softened lower heat slightly and add the garlic and sauté for a minute. 3. Push the rice to the side of the pan and add a bit more oil. Crack the eggs into the oil and cook. Mix with rice. 4. Add the soy sauce and salt and pepper. Season to taste. Remove from heat. 5. Add most of the scallions and a little cilantro into the rice and mix. Garnish with the rest of the scallions and coriander, lime, and cucumber slices. Note: If you are adding meat, cube it and cook it first. Then add into rice at step 4.